“Can you feel it, everybody? 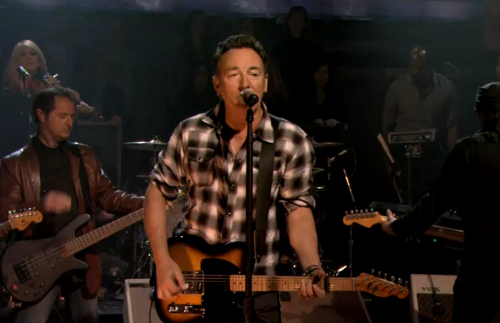 Can you feel it?” Jimmy Fallon, hardly a closet Springsteen fan, screamed at his audience prior to a two-hit punch by The Boss. With Wrecking Ball due in stores next Tuesday, March 6th, Bruce Springsteen and the E Street Band has shacked up in Studio 6B for the week. Last night, they pummeled through their new single “We Take Care of Our Own” in addition to the album’s titular track. If there’s one thing to take away from either performance it’s that Springsteen, now 62, performs with the agility of a 22-year-old. He slams into his guitar with blunt force, he spits out lyrics like they’re chewing tobacco, and he exudes an energy that recalls the heyday of Joe Strummer. It’s going to be a good week, folks. Catch up below, courtesy of The Audio Perv.